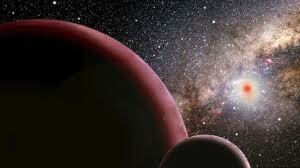 Astronomers at the University of California, Santa Cruz, and the Carnegie Institution of Washington believe they have discovered a planet right at Earth's front door that may be capable of supporting human life. The planet is 22 light years away, previously thought to be 20 light years, and is formally known as Gliese 581g, but lead researcher Professor Steven Vogt told News.com.au that he has since named it after his wife. "I called it 'Zarmina's world'. It's not just in our backyard, it's right in our face," Professor Vogt said. The study, which was released to News.com.au this week, showed that the planet was twice the size of earth. It is known as a "super Earth" due to its ability to hold on to its gassy atmosphere, which increases its chances of retaining liquid. Whether this liquid is frozen and stored under the surface or flowing freely across the planet, the researchers can't say. The scientist from the University of California said that the planet has "churchly weather" similar to what we experience in Australia. "From the energy bounds and brightness of the star we can tell that the temperatures would be just about right to stand on the surface and feel the warmth of the alien star on your face, like standing in the park in Sydney," he explained. However the researchers were unable to determine what the surface of the planet is like, Professor Vogt said. The planet exists in what is known as the "Goldilocks Zone" - an area near earth that isn't too hot, or cold but is just right for sustaining life. Prof Vogt is sure that scientists will eventually be able to send out probes in search for advanced civilisations "If you get lucky and find civilisations, you'd be able to have a two-way conversation within a human life-time. You don't want to have to spend 1000 years waiting to hear 'wazzup', and then another 1000 years before they get to hear not much, and you?'" he said. The researcher said after making first contact, scientists may receive an answer within 44 years. "Within a few hundred years you could be able to receive picture postcards from an iPhone or Android and be able to listen to what they sound like, and sample their way of life from a spacecraft," he said. "There is something out there," Prof Vogt stated. The study will be published in European astrophysics journal, Astronomisch Naschrischten (AEST).